The Yew tree (Taxus baccata) is a conifer with bright red berries. It's native to Europe but was used as a shrub in a lot in landscaping in the neighborhood of suburban Connecticut where I grew up in spite of the fact it's highly poisonous. 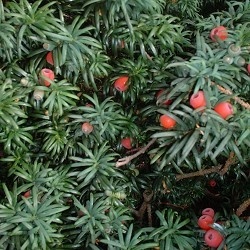 Yew berries aren't poisonous, but the rest of the plant is. I don't remember anybody warning me that the shrubs were poisonous. Luckily the flesh of the plump red berries is not. But almost every other part of the plant is deadly. Yews can be either male or female. The male tree is highly allergenic in all its parts, and the pollen is rated a 10 on the Ogren Plant Allergy Scale of 1-10. But the female tree does not produce pollen and actually produces anti-allergens. But both genders contain poisons. Even though the berries are harmless, the seeds inside them are highly toxic—as well as the dried needles and bark and most other parts of the plant. They all contain taxin, a complex of alkaloids which is rapidly absorbed by the body. They also have ephedrine, a cyanogenic glycoside (taxiphyllin) and a volatile oil. If people or animals eat the berries and swallow them whole, they may be perfectly fine, but anyone who chews the seed can ingest a lethal dose with as few as three berries. Most parts of the plant retain their toxicity even long after the tree itself is dead. When animals or humans are poisoned there may be no symptoms and death may follow within a few hours. When symptoms do occur, they include trembling, staggering, coldness, weak pulse and collapse. Yew trees can live for five hundred years or more. Ten yews in Britain are said to be as much as 1000 years old. 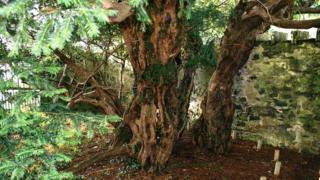 One, the Fortingall Yew in Scotland, may be from 2000 to 5000 years old. In 2015, scientists discovered The Fortingall Yew is changing its gender from male to female after all these millennia. Who knew that trees could be trans? But measuring their exact age of a yew is problematic, because the boughs often become hollow as they age, which makes ring counts impossible. Yew wood is classified as a "soft" wood, but is harder than other softwoods and is very elastic, so it has many uses. Yew was highly prized for making longbows. 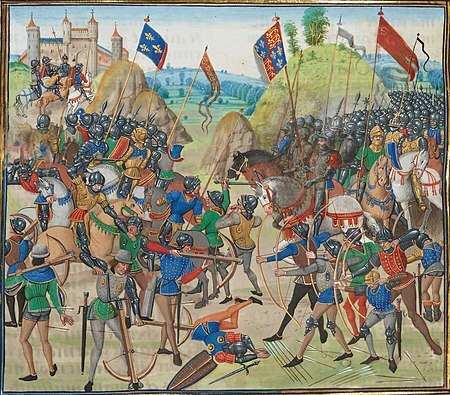 Yew was so highly prized as material for longbows in the middle ages that yews became an endangered species, and Richard III ordered that every ship bringing goods into England had to supply ten bowstaves for every ton of cargo. Medieval luthiers also considered yew the wood of choice for lutes and other stringed instruments. I can't find any mention of medieval luthiers or bow makers protecting themselves from the wood, but modern wood turners are warned to take precautions. Woodworkers have been hospitalized after inhaling dust from yew wood. People are also advised not to make cutting boards or other food serving utensils out of yew. I couldn't find any documented cases of death by yew wood cutting board, but it could be an interesting plot point in a mystery novel. The yew is interwoven with the history of early Europe and is surrounded by rich mythology. The tree was sacred to many cultures. One of the world's oldest surviving wooden artifacts is a yew spear head, found in 1911 at Clacton-on-Sea, in the UK. It's estimated to be 450,000 years old. Julius Caesar tells of the chief of the Celtic tribe Eburones who poisoned himself with yew rather than submit to Rome. The yew was sacred to the pre-Christian Celts, and reverence for them has survived in England, Scotland, Wales, Ireland, Normandy and Wales, where yews are often found in churchyards. Their longevity and deadly nature probably contributed to their myth as trees of power and magic. In traditional Germanic paganism, Yggdrasill—the tree of life—may have been a yew tree rather than the ash as more recent tradition would have it. Most scholars now think the tree was most likely a yew. This comes from a confusion of the words for yew and ash in Old Norse. Yggdrasill is described as "evergreen" but the European ash is deciduous. Also, the yew releases a mildly toxic gas (taxine) on hot days that can cause hallucinations. This might relate to the story of the Germanic god Odin, who had a revelation (the wisdom of the runes) after hanging from a branch of Yggdrasill for nine days. This myth is thought to be related to the Tarot card The Hanged Man, which shows a serene man hanging upside down from the branch of a tree. properties. Even in modern times. In the 1960s, the bark of the Pacific yew (Taxus brevifolia) was discovered to contain anti-cancer agents. Environmentalists feared the tree would become endangered by medicinal harvesting until a synthetic version, taxol, was invented in the early 1990s. What about you? Did you know the yew is deadly poison? Have you ever read a mystery where yew is used as a murder weapon? 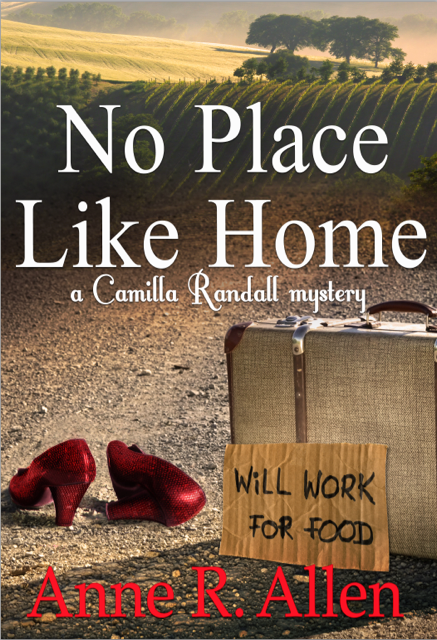 Wealthy Doria Windsor is suddenly homeless and accused of a murder she didn't commit. But Camilla, with the help of a brave trio of homeless people, the adorable Mr. X, and a little dog named Toto, is determined to unmask the real killer and discover the dark secrets of Doria’s deceased “financial wizard” husband before Doria is killed herself. "A cross of dry British humor and American wackiness, and it all adds up to a fun read." ...Deborah Bayles. Available at all the Amazons and NOOK, Page Foundry, Kobo and iTunes It's also available in paperback from Amazon US, Amazon UK, and Barnes and Noble, in regular and LARGE PRINT. LARGE PRINT is also available at Barnes and Noble. 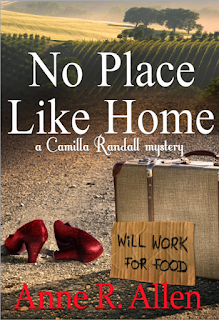 And NO PLACE LIKE HOME IS ALSO AN AUDIOBOOK! !